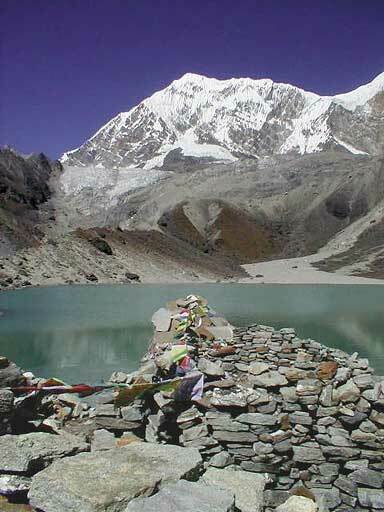 We have just returned from Trek II to Dudh Kunda, a 15,000 foot pilgrimage lake sacred to both Buddhists and Hindus, and Pike (two syllables) Danda, the only place to which regular people go from which you can see five 8,000 meter peaks (Kanchenjunga, Makalu, Everest, Lhotse, and Manaslu). 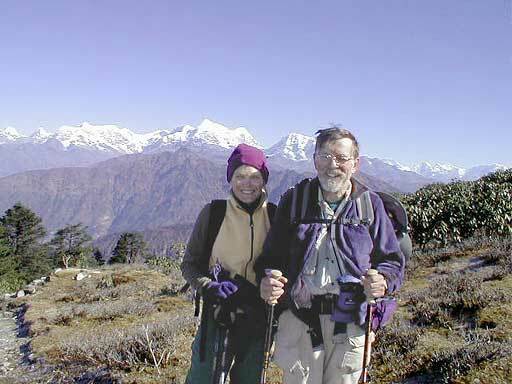 While our Annapurna trek was to the northwest of Kathmandu, the the Dudh Kunda trek was to the northeast toward Everest. The bus ride to our starting point in Jiri took nine hours of grinding up steep hills and winding down into valleys. In the Annapurna area we were teahouse trekking, staying in small lodges, and having a single porter to help carry our stuff. 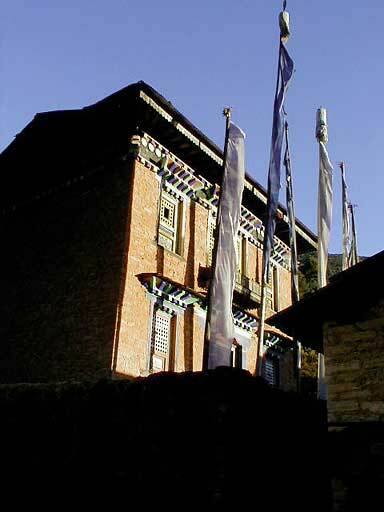 Today's trekker lodges are an extension of the ancient infrastructure to support trade with Tibet. A room for the two of us ranges from 40 cents to $3.00, with attached bath; three meals a day added up to about $5.00 apiece, with soft drinks getting a bit more expensive with each day of carriage on someone's back. 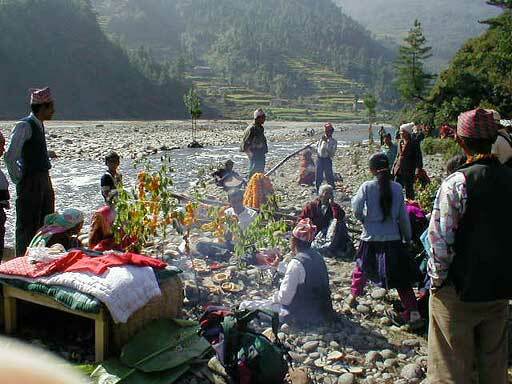 By contrast, the Dudh Kunda trek was a full-blown expedition. Because we were going into areas with no lodges and needed to be self-sufficient, we has a crew of 17 people supporting four trekkers, Clark Parish and Cheri Baird, friends from Bellingham, in addition to us. The entourage consisted of a Sherpa guide Kami, an assistant Sherpa guide Tseri, cook Puri, 3 "kitchen boys", and the rest porters. They treated us like royalty - bed tea and wash water brought to the tent first thing in the morning, hot towels for hand wiping before each meal, tea at five, a toilet tent, bath tent, and dining tent, in addition to our sleeping tents. It took a bit of getting used to, but it was pretty clear that that was the way things were going to be. The food was great and plentiful. Carrying about 80 pounds each, the porters could only move down, or up, the trail about 3 times faster than we could. Kami has worked with all of these men for years and does a masterful job of instilling a spirit of joy into the whole enterprise. When we would come dragging into camp after the tents were all set up the men would greet us as though we had just topped Everest. We shared a number of wonderful evenings listening to the men sing Nepali songs and dance traditional dances, which we joined occasionally under coersion. By the end of the trek we had developed a deep affection for these strong, gentle men who carried our burdens and took such good care of us, all without a glimmer of resentment. Once when Dana thanked one of the porters for carrying our bag, he replied with a smile, "It is my duty; I must do it well." And he did. The three week trip was far too rich to describe blow by blow. Seldom did five minutes go by without producing a memorable face, scene or event. Below are some of the images we brought with us from the trek. 1. 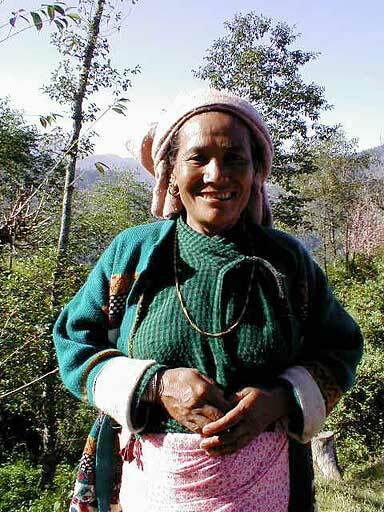 A few hours after beginning the trek in Jiri on the traditional route to Everest, we came upon this beautiful, dignified woman squatting beside the trail peeing. As we passed, she rose and for the next half hour walked with us and talked in Nepali about beauty of the countryside, how many children she and we have, where everyone was from, and where everyone was going. 2. This house is typical of those we passed or could see dotting the hills in the agricultural region through which we hiked. Note the corn drying under the eves and the log bee hives on the lower roof. This time of year, harvesting and drying products of the fields is a major activity. The houses are usually well washed with a mud slip, often two toned as is this case. The early morning and late evening light on the houses is a visual feast. In addition to endless marigolds, many homes are adorned now with twelve foot purple dahlias and house high poinsiettas. 3. One of the striking things about walking in Nepal is the frequent encounter with symbols of religious devotion, in this case two large chortens in front of an old gompa on the trail into Bhandar. Three men were readying one of the chortens for a new paint job while a group of Sherpa women supervised. Prayer flags are strung here and wherever the wind might catch the messages of peace and well being and spread them through the valleys. 4. 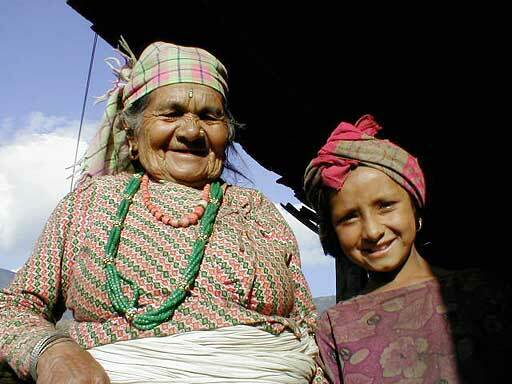 This old Tamang woman watched from her balcony as we walked out of Junbesi. As always, we asked before taking her picture. She waved o.k. but wanted her granddaughter included. When I showed them the display on the back of the digital camera, the granddaughter was delighted, but the old woman pointed to her eyes indicating that she could not see the image. 5. 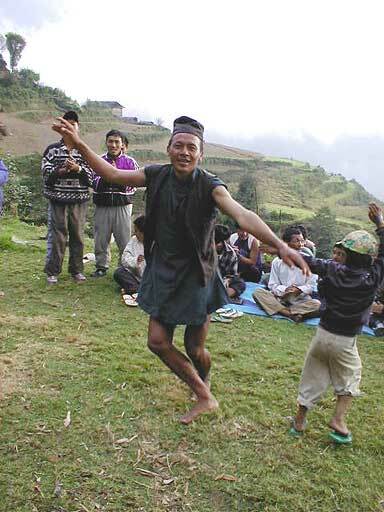 Tsamar, the best dancer among our porters. 6. 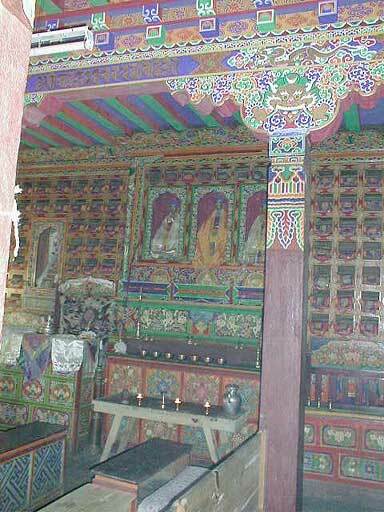 At 3000 meters, Thubten Chhuling is a large Tibetan monastery about an hour from Junbesi. On the trail to the monastery, a constant stream of brightly dressed nuns carried home baskets of potatoes on their backs to feed this community of over 300 monks and nuns. 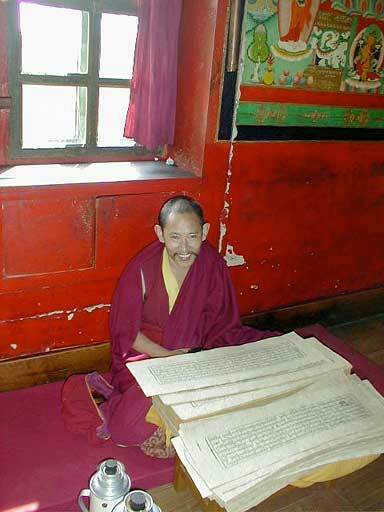 When we entered the gompa at the monastery, this monk was chanting sacred texts. He smiled at us and gave the customary Tibetan greeting, "tashi delai." Sipping a cup of tea, the monk wanted to know where we were coming from, where we were going and where we were from. He beamed when I asked to take his picture. Religion here does not seem so infected with piousness and overblown sanctity. 7. Still at Thubten Chhuling Monastery, an old Tibetan woman guards flat baskets of yak (actually nak - only the males are yaks) cheese from marauding birds with a long bamboo pole with a plastic bag tied on the end. 8. Well off the beaten track, we are camped Sarsarbeni above 11,000 feet, where our only neighbor was a family of yak herders (actually mostly nak herders). For five or six days we saw no people other than yak herders. Yaks and naks (and increasing it is suspected, Jacks) cannot come down below 10,000 feet because they cannot tolerate bacteria found in the water below that level. Pictured are the local royality having breakfast in the morning sun. Sad to say, Cheri missed this part of the jaunt because of illness. Behind us are Numbur (6959 meters), Khatang (6353 meters), and Karyolung (6511 meters), the three mountains that cup Dudh Kunda. 9. As soon as his son brought the 20 or so shaggy naks down from the surrounding hills, the herder began milking. The crusty wooden bucket is adorned with a marigold, as were some of the naks, in honor of a largely Hindu festival, even though these people are Buddhist. 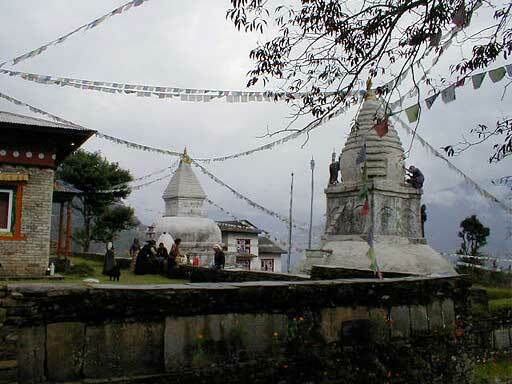 Festivals, shrines and deities are freely shared. 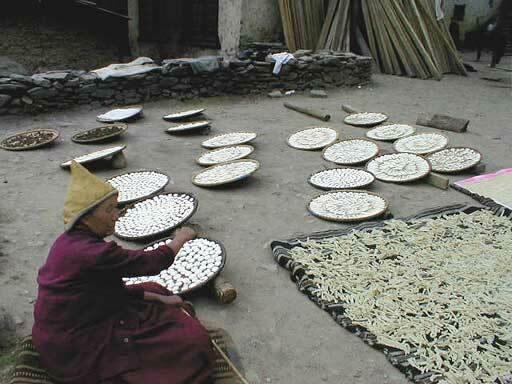 The milk will be made into butter and sold, at least some going to make yak (actually nak) butter lamps burned on altars. 10. Dudh Kunda. A number of our crew hiked to the lake from our camp before sunrise to pray, burn incense and do other religious practices collectively called puja. For a month in August thousands of pilgrims ascend to this site, but otherwise it is largely left alone. 11. 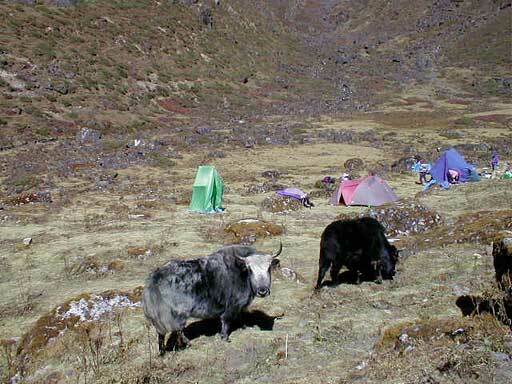 Yaks (actually naks) invade our camp at Chhuware on the way down from Dudh Kunda. 12. 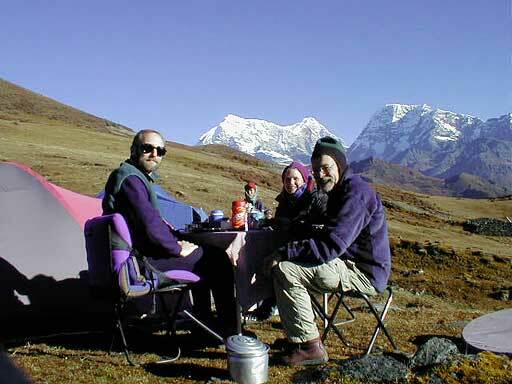 On our 15th night out we camped next to Loding Gompa. In typical fashion, it is richly painted in elaborate symbolism of Buddhist iconography. 13. Early morning sun on Loding Gompa and its prayer flags. 14. On our way up the ridge to Pike, we stopped for lunch next to a yak herder stone hut at Chaokpa. I asked Kami to ask the woman if she had anything made of yak hair she would like to sell. She said that her mother had make a blanket the year before and she thought she would be willing to sell it. It had taken her almost a year to weave and had used the hair of 30 yaks and naks. The mother lived an hour away steep downhill fast Nepali walking and another hour back, uphill carrying a very heavy yak hair blanket. The woman did not think twice about directing her brother to fetch the blanket on the chance that we might buy it. Two hours later the brother returned with a beautiful stripped blanket made in six panels on a backstrap loom. It matches the four basic colors that yaks and naks come in - black, grey, off white and brown. 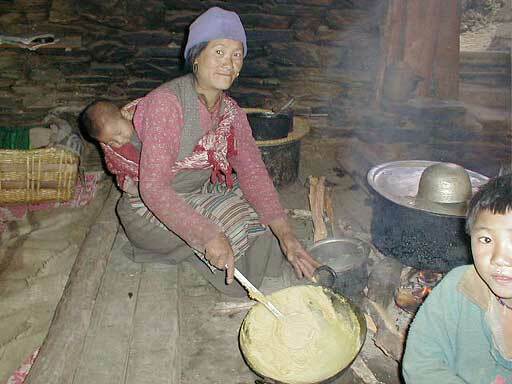 Here the woman is preparing a buckwheat meal mash for her four young children. 15. The Jacks (actually looking more and more like naks) near Pike Danda. 16. 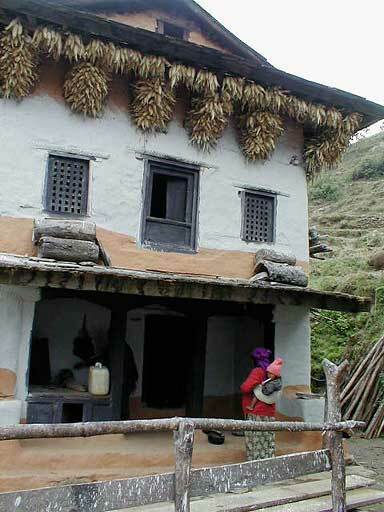 As we packed up to leave Shivalaya, we heard drums and raspy horns from the surrounding hillsides. From several directions came processions of brightly dressed Hindus with horns, drums, marigolds, and tall poles with the tree top still in place. It was a festival to honor mothers and fathers who had died in the past year. The processions began meeting by the riverside where they played music and strung marigolds from poles erected on either side of the river. This is a glimpse of the milling about beside the river. We were beckoned to join in. This is the third major Hindu festival in the past six weeks. There should be a bumper sticker "Hindus Have More Fun". We are having an amazing time and are well and happy. Every day is like standing under a waterfall of intriguing, mind-stretching experiences. In a couple of days we set out for one last trip before trekking closes down for the winter.